Your local network may seem to be a seething mass of writhing protocols—a bit like a nest of worms you don’t want to look at or stick your hand in. iNet (Mac App Store link) disentangles the worms, cleans them up, and reveals them to be rather pretty, taken alone. The program is a network viewer and troubleshooter that provides insight into the many different kinds of activity constantly occurring on any Ethernet or Wi-Fi network. This includes Bonjour activity, in which devices and services continuously say, “Hello! Hello! Hello!” to announce what they can do; active devices on the network and information about them; and a vast array of well-presented data for each Wi-Fi base station on the network to which you’re connected. You can use iNet to extract bits of information you may need for setting up new services on a network—for example the IP address assigned to a given device from your base station's private stash. iNet can also provide live data about the performance of Wi-Fi clients and base stations, and thus let you troubleshoot problems or figure out the optimal location for a router or for working on a laptop or mobile device. The program has three main views, each letting you view the network through a different lens. The Network Scanner is a glimpse into the hardware that’s connected to your local network. Computers, routers, and other devices constantly broadcast a tiny bit of information about themselves; iNet grabs that data and performs tests to obtain more details. The Network Scanner view lists every device connected to your local network. 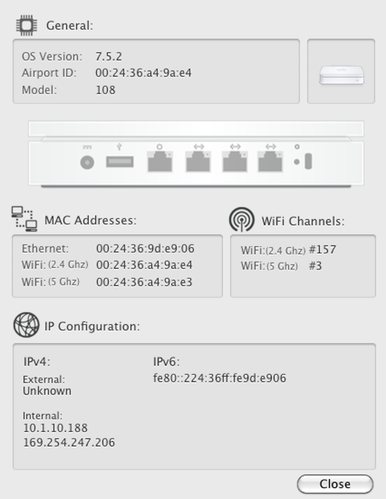 For each device, the Network Scanner shows the device name (if available), IP address, Media Access Control address (or MAC address, a network adapter’s uniquely assigned identifier), and detailed information about the device’s type (for example, a router) and status (such as whether or not it replied to a ping from iNet). The scanner makes it simple to grab the IP address of any device, by name or device type, as well as to be sure the device is responsive (based on a ping from iNet). It’s also a nice way to pull up a device’s MAC address if, for example, you want to use a base station’s access controls to restrict network use based on hardware addresses. You can sort the list by IP address, device name, or vendor name. The Bonjour Browser displays, by service or host, detailed information about every Bonjour-enabled service on the local network—services such as File Sharing or AirDrop send out a fair amount of detail about what they have to offer. This three-column-browser view reveals more information than you might possibly be interested in, but it’s fascinating to scroll through. The Services view lists every available service; selecting a service—for example, AirDrop—reveals which devices are currently offering to perform that task. The Hosts view lists every host announcing Bonjour services, letting you browse each device to see what it claims it can do for a networked peer. You can examine a particular Bonjour service and the information it’s broadcasting. The well-presented information lets you determine if a piece of hardware isn’t offering something it should—for example, a Mac and printer sharing—which can help you track down why. Or, if you don’t want something to be available, but the host is nevertheless chatting away about it, you can take measures to turn off that service. The details of a Bonjour offering may also be useful when they're otherwise hard to get at. For instance, if my router or firewall is blocking iTunes Home Sharing, so I need to open up a specific port to allow it, I can click the iTunes Home Sharing service in iNet, select a computer, and see that iTunes Home Sharing uses TCP/IP port 3689 for communication. An almost-hidden option in the Bonjour Browser view is the unlabeled pop-up menu at the top, which shows local. by default. If you have Back To My Mac enabled via iCloud or MobileMe, you can choose the item in the menu that resembles ########.members.btmm.icloud.com. (where ######## is a sequence of numbers) to view any Bonjour resources offered by remote computers configured to use your Back To My Mac account. 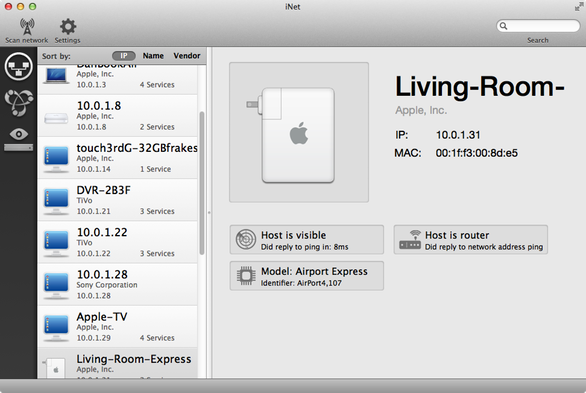 The third view, AirPort Monitor, is a window into the breathing patterns of your Apple-branded Wi-Fi gear. Using SNMP (Simple Network Mapping Protocol), an industry-standard method of sharing statistics, the monitor shows a wealth of information for each base station. Select a base station to view it’s details; you can view those details by network traffic or by Wi-Fi client. The Wi-Fi Clients view in AirPort Monitor reveals extensive details about a base station and connected clients. The network traffic screen shows the amount of data per second passing across the WAN (connection to the Internet), LAN (local Ethernet devices), and Wi-Fi interfaces. It’s a good way to check on network activity if you’re concerned that devices aren’t properly communicating with each other or to the Internet. For example, you can can perform a data-heavy action, such as downloading a large file from a website or transferring a file between two local machines, and see how the base station performs. 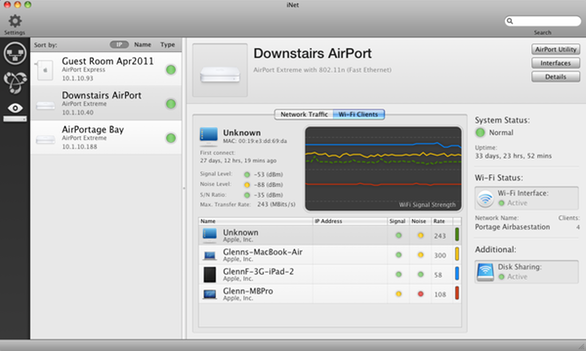 The Wi-Fi Clients view is roughly equivalent to the Wireless Clients view in AirPort Utility (accessed in a base station’s Advanced screen by clicking Logs and Statistics and then Wireless Clients). But iNet offers a better dashboard summary, including Bonjour names and other details about each device. For instance, iNet tells me my MacBook Pro has been connected to my router for 34 days, 3 hours, and 28 minutes—I didn’t even know connection time was stored. By letting you monitor the quality of signal and noise, and the ratio between them, the clients view allows you to move laptops, mobile devices, and base stations around to find the best performance. (Short answer: You want numbers closer to zero for signal and noise, and a ratio as far from zero as possible.) Note that iNet’s signal-strength graphic uses only four colors to identify clients, so if there are more than four devices connected to a base station, you’ll see multiple lines of the same color. If you select a client in the list, however, the corresponding line switches from solid to dashed to highlight it. A Details view in AirPort Monitor offers nitty-gritty information that's useful when configuring or troubleshooting a base station. For those who want even more information, such as the selected base station’s Wi-Fi channel numbers, IPv6 address, and ethernet and Wi-Fi MAC addresses, clicking the Details button reveals all. The only flaw I’ve found in iNet is the lack of persistent graphing data in the Wi-Fi Clients view. By default, the program collects data only when you select a base station and then click the Wi-Fi Clients tab. I’d rather iNet gather and graph this information whenever the program is running, as this would provide a bit of history. But this is a minor complaint. iNet is a treasure, offering an easy-to-use summary of information that would otherwise need to be compiled from myriad sources using various components of Apple and third-party software. Having all the information in one place, beautifully presented—without the aesthetics detracting from or distorting the data—makes this a must-have for anyone troubleshooting network issues. At $6, it’s a steal. Glenn Fleishman, a senior contributor at Macworld, is the author of Take Control of Your 802.11n AirPort Network, recently updated for Lion.